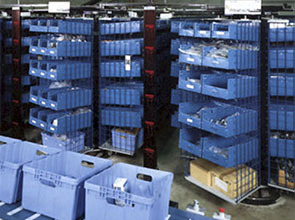 These computer-controlled, automated storage and retrieval devices can operate as a central inventory storage carousel and also as an integrated materials handling solution. Central Pharmacy and General Warehouse. • Saves up to 80% of floor space by turning unused air space into productive storage space. • Increased Productivity of up to 600% due to substantially reduced pick, access and retrieval times. • Improved Ergonomics: all goods are delivered to an ergonomic access opening eliminating bending and reaching for goods. • Improved inventory accuracy and management control: over 99% of stock accuracy levels on a regular basis. 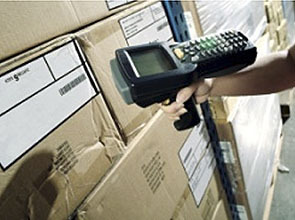 Protection against unauthorized access to inventory. • Safety: Redundant safety systems provide safety for both workers and stored goods. • Refrigerated and Freezer storage. 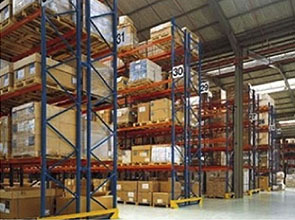 Computer-controlled, automated storage and retrieval devices that can operate as a central inventory storage carousel and also as an integrated materials handling solution. 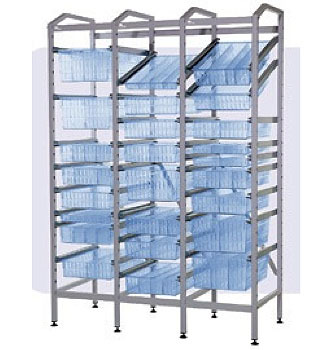 • Floor Saving that achieves the same storage capacity in 30% less space than conventional shelving and racks. • Increased Productivity of up to 800% by eliminating wasted walk and search time during picking and retrieval. An automated transport system using a mobile robot that manages and executes transport tasks based on an optimized strategy. The goods typically transported by AGV include carts of dietary/food items, medical/surgical supplies, pharmaceuticals, linen, trash, regulated medical waste and general housekeeping items. In the hospital. This AGV system links the central processing areas such as the kitchen, laundry, trash dock, receiving, sterile stores, etc. with the patient floors. The system is fully integrated to automatically operate doors, elevators/lifts, cart washers, trash dumpers, etc. • Precise and safe operation. • Efficient, reliable and flexible transport. Punctual delivery, no destination errors, more precise inventory management. Flexibility for on demand tasks. • Optimization of costs and processing time. 24/7 operation days with no human intervention required. 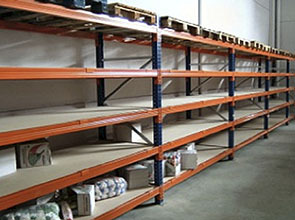 Pallet racks, warehouse and pharmacy, shelving, gravity racks. Light-directed order fulfillment systems use luminous LED and display modules mounted to shelving, flow rack, work benches, pallet rack or other storage locations. Whenever a product is needed from a particular location, the right indicator turns on, drawing attention when action is required. The operator picks/put the product quantity displayed. 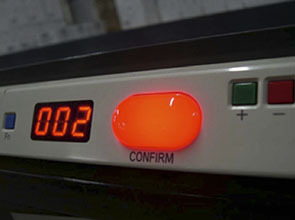 The operator then confirms the pick/put by pressing the illuminated button. There is a wide range of different picking systems. Hospitals mainly use two systems: “piece picking” and “case picking”. In addition, the system enables the operator to carry out inventory checks and replacement requests from the illuminated modules. Central Pharmacy, General Warehouse, Laundry. • Increased Productivity of between 25% and 50%. The fastest operator-based picking strategy available. A paperless pick/put reduces costs, reduces errors and streamlines operations. Simultaneous: various orders are prepared at the same time, which allows the operator to choose the best pick path. Also reduces walking, as each operator works in a zone, and orders are passed form zone to zone on a conveyor. •Improved order accuracy: error rates are less than 1% on a regular basis. 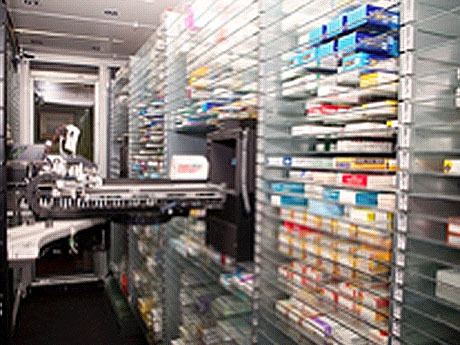 The dispensing robot is a centralized, computer-controlled drug distribution system integrated with the hospital HIS and ERP, which automates storage, dispensing, returns, restocking and crediting medications for inpatient or outpatient, using one or two robotic arms. • Increased Control and traceability in accordance with the defined security level, unequivocally identifies the user requesting medication or other medical products and can only dispense the requested product and quantity via LED display. • Increased Productivity of between 2% and 15% due to automation of manual actions of paperwork and checklists. • Reduces costs by an average 5 to 10 percent due to lack of efficiency in inventory control. • Improved inventory accuracy and management control: over 99% of stock accuracy levels on a regular basis. 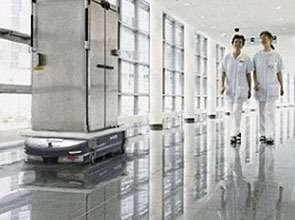 Specialized carts and trolleys for general warehouse and central pharmacy. 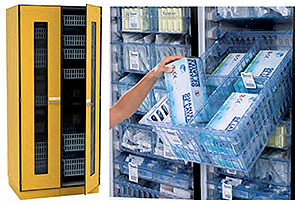 Complete modular solution for storing all medical products. Based on a double-compartment storage concept, Kanban provides ideal logistics management for every hospital unit in terms of storage, transport and distribution. For basic storage it uses unit trays and baskets of different standard sizes and heights, which that can be divided into compartments and have label holder supports or devices to identify the stored product. 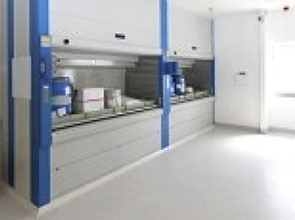 The system is completed with cabinets, shelving, trolleys and devices to automate restocking. Advantages include: less storage space, better stock management, improved stock rotation, improved ergonomics and flexibility. • Space Saving up to 50% by using the entire space. The tray and basketsystems allow use of the total space, from back to front, in the cabinets or shelves. It can also be divided to accommodate different items, so all the available capacity is utilized. • Cost reduction of up to 30% in stock, floor space, labor costs and expired products by using the double compartment storage concept together with automated restocking systems like the RFID panel, which also helps to reduce the number of products out of stock. • Improved Ergonomics: access to the goods is more ergonomic than traditional cabinets with fixed shelving. 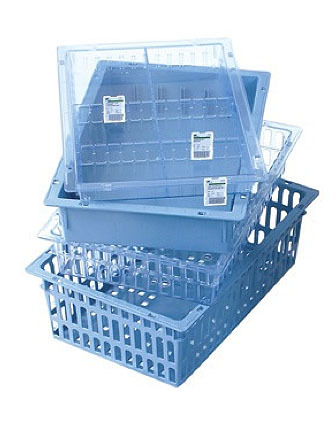 Trays and baskets can be withdrawn safely without falling out, so the entire contents can be seen clearly. Modules at higher levels can be positioned and withdrawn at an angle, allowing greater access to the contents. There is also no need to bend down to access the lower levels. • Flexibility: our range of trays and baskets can accommodate most consumable items in use in hospitals. There are specific sectionsto properly store catheters and tubing. Trays and baskets, as well as their contents, can be repositioned easily at different heights by simply changing the dividers. • Made from colored or transparent ABS. • Standard size of 600 x 400 mm or 300 x 400 mm (basket only), in accordance with ISO3394. Height of 15 mm, 50 mm and 100 mm for the trays and 100 and 200 mm for the baskets. • 25 Kg of load capacity. • Smooth walls for hygienic cleaning. • Solid and quick attachment of the divider. • Label holder, protective cover and label. • Special storage sections for catheters and tubing. • For trays and baskets of standard sizes 600 x 400 mm or 300 x 400 mm, in accordance with ISO3394. • Water-resistant and continual working surface for easier cleaning and disinfection. • Modular system panel guide made in ABS with roulettes. • Basket tilt to 45º. Once one compartment has run out of stock, just passing the RFID label by the RFID panel will make the system automatically order the restock of the product. Users can also use the interface to manage the stock at the hospital unit. 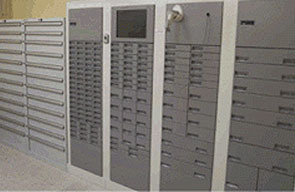 Automated, computer-controlled, modular storage and dispensing cabinets, integrated with the hospital HIS and ERP. An ideal solution for storing medication and other medical products. Increases medication safety and improves medication and other materials logistics. The products are stored in the cabinets by unit, product or drawer according to the required security level. The cabinets are available in various sizes and colors. • Increases Control and traceability according to the defined security level, unequivocally identifies the user requesting medication or other medical products, and can only dispense the requested product and quantity via LED display. • Increases Productivity between 2% and 15% due to automation of manual actions of paperwork and checklists. • Reduces costs by on an average of 5 to 10 percent due to lack of efficiency in inventory control. 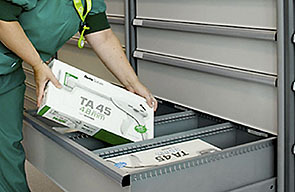 Intelligent, computer-controlled, modular storage cabinetsintegrated with hospital HIS and ERP. Provides security and traceability for products. The ideal solution for managing items with high value or with special security requirements. 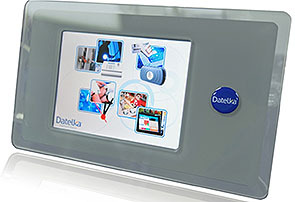 A cabinet with a structure adapted to an RFID-controlled environment, including exterior shielding and internal reading optimization, which makes a fully automatic stocktake of products inside, which are identified with an RFID tag. The cabinet identifies the user opening the door and registers and assigns to the user the items that have been collected without any other action. • Intermediate stocks in advanced units. • Products on consignment, with remote consultation by the provider. • Laboratory (confirmation of the expiration date and batch control). • Increased Control and traceability: unequivocally identifies the user who is opening the cabinet, which products are being collected and for which patient or hospital service. • Increases Productivity by between 2% and 15% due to automation of manual actions of paperwork and checklists. • Reduces costs by on an average of 5 to 10 percent due to lack of efficiencies in inventory control. • Improved inventory accuracy and management control: over 99% of stock accuracy levels on a regular basis. An alarm system and redundant access control which work with and without power provide protection against unauthorized access to inventory. Closed and open carts with a modular tray and basket system. Various types and sizes of carts and trolleys for picking and materials transport, laundry, waste, etc. 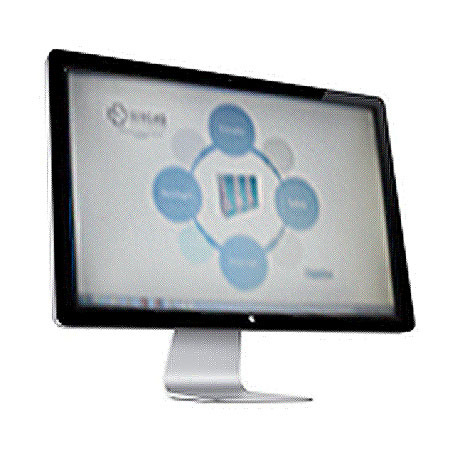 Flexible and modular logistic solution that can integrate all devices and systems with hospital ERP and HIS. Maintenance service 24h x 365 days.